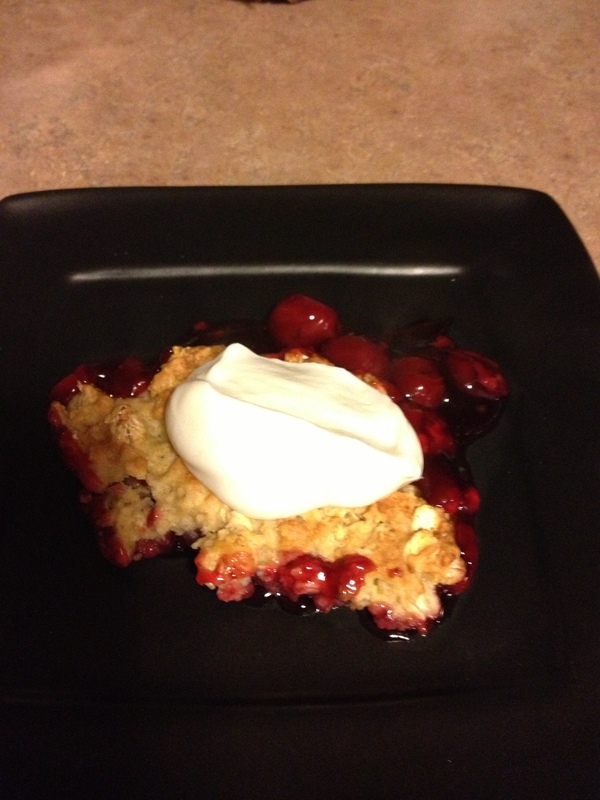 -1 container of Oikos Vanilla greek yogurt for topping, optional (adds 25 cal per serving). 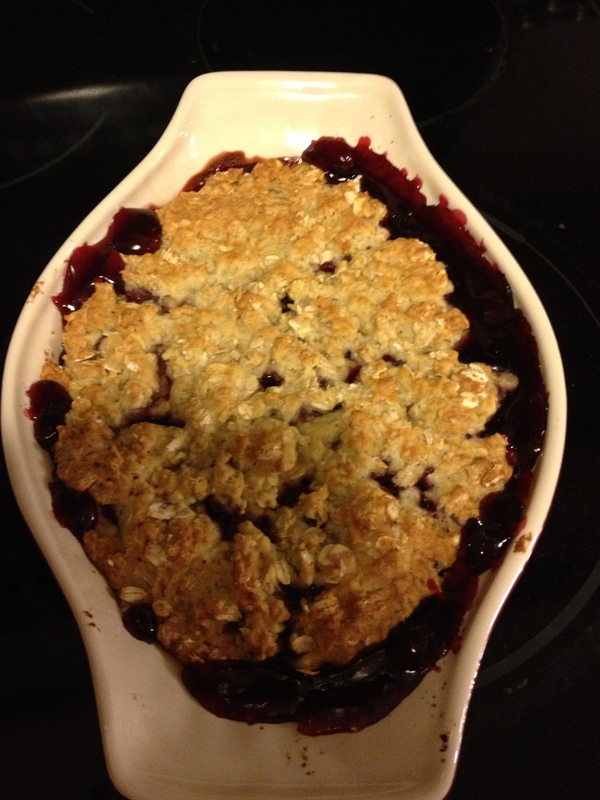 1. pour cherry pie filling into a casserole dish (9×9 is too large, I used an oval 8×11). 2. in a separate bowl, mix all the crust ingredients together. 3. spread crust ingredients over top of filling. 4. Bake at 350 for 30 minutes, or until golden brown. 5. Top with vanilla greek yogurt. I split one single serve container 4 ways, adding 25 calories per serving. -4 wooden or metal skewers, soaked for about 10 min in water before prepping. 1. Place chicken pieces and marinade in a large ziplock back. Marinate at least 30 min. I usually do this about 8 hours. 3. 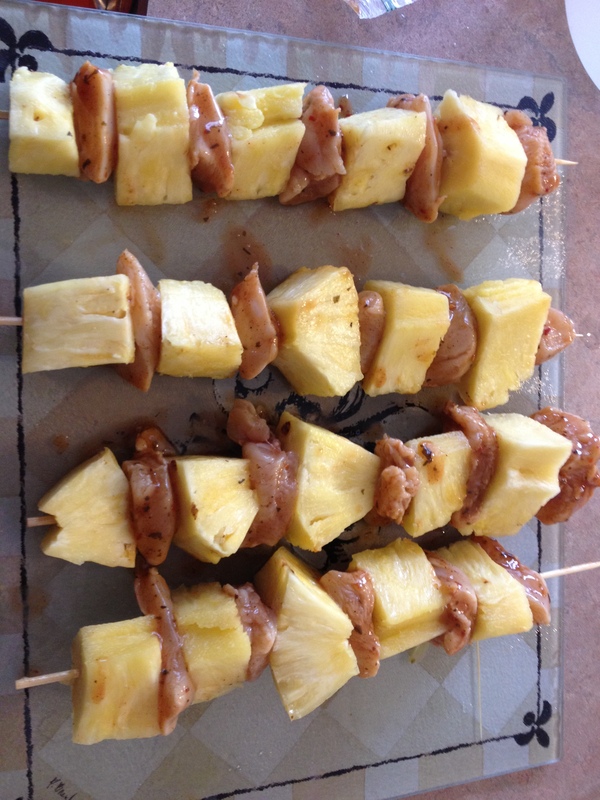 Alternate Chicken, Onion, and Pineapple onto skewers. 4. Grill, turning regularly, for about 12 minutes on medium, or until chicken is cooked through. 5. Turn grill up to high, and cook an additional 5 min or so, turning regularly. 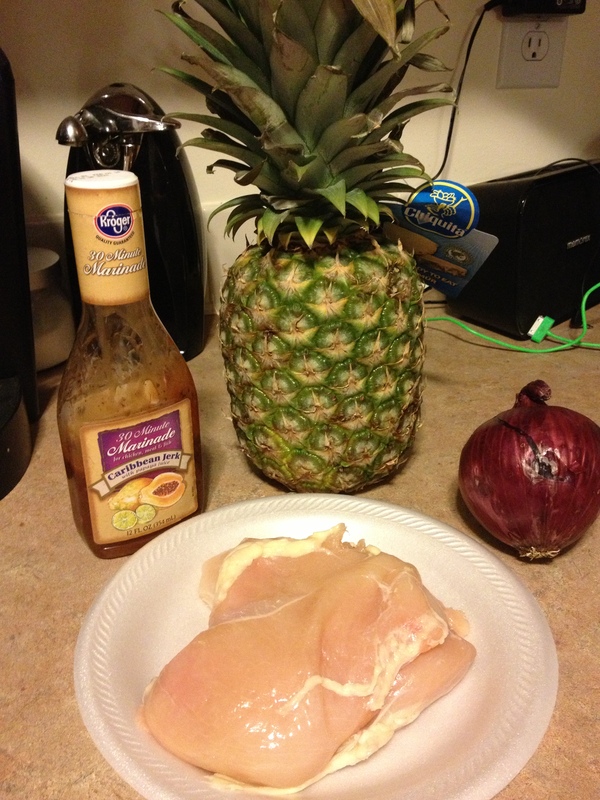 This allows pineapple to caramelize a bit, and onion and chicken to get a nice char on them. 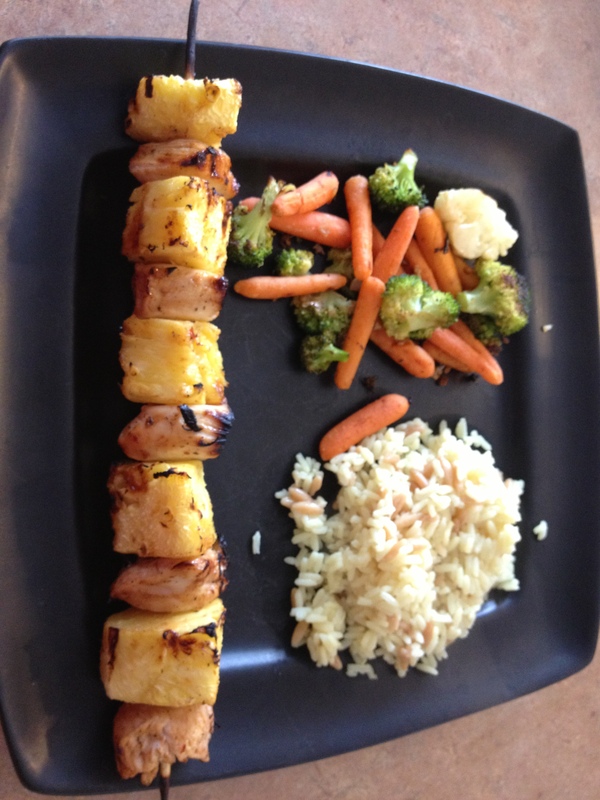 *As you can see, I used the “before” pic, but forgot it when actually making the kabobs….*sigh*…. there’s always next time. My Grandma and my Mom both made Goulash when I was a child, so I guess it’s probably a “comfort food” for me. It’s hot, hardy, delicious, and a little sweet. Really hits the spot on a fall or winter evening. There are a lot of different types of goulash. Some folks will argue that by “hungarian goulash” terms this isn’t a goulash at all. However, I guess this is “hillbilly goulash” because…this is what we ate in Kentucky when I was a kid, and in my house still today. 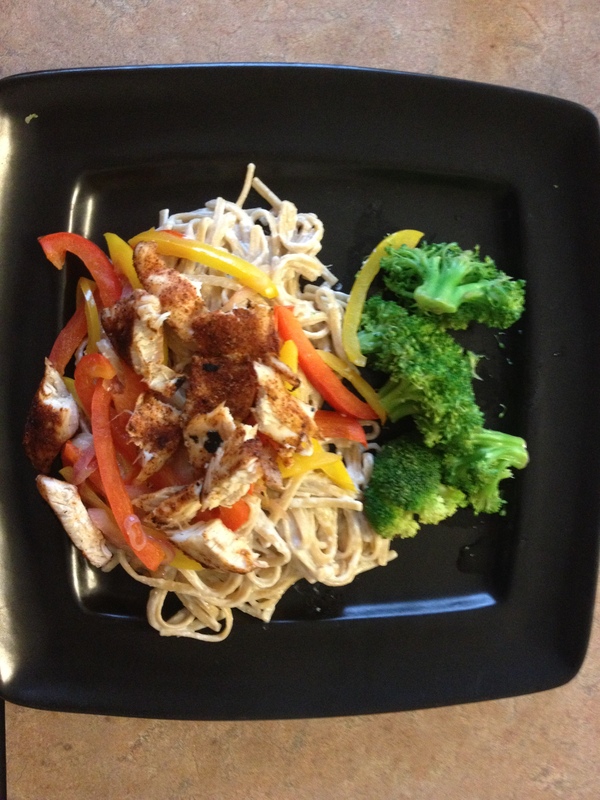 When I first calculated the calories after coming up with a “slimmed down” recipe, i was excited to see just how calorie friendly it actually can be. Serve with a mixed green salad with lite dressing if you want. 1. brown beef, onions and peppers together until done. Drain fat. At same time boil noodles al dente. 2. Add noodles to beef, then add all other ingredients. 3. Cook on medium until noodles are soft and flavors are well blended. 4. Divide equal portions into a bowl, and enjoy! 1. place chicken breasts in crockpot. 2. Mix milk and Soup together and pour over soup. 3. Mix stuffing mix and water together in a separate bowl. 4. Spread wet stuffing mixture over top of chicken and soup. Note: THIS LOOKS TERRIBLE… it’s not at all pretty to look at. So, consider yourself warned (lol) BUT it tastes great. Just scoop it all out and eat it together with a veggie on the side.